Prior to Mission: Restore’s surgeon educators arriving in Mwanza for our November 2015 surgical training trip, participants in both Tanzania and the U.S. connected through video conference calls (one component of our telemedicine program). This initiative allowed our local surgeons and surgeon educators to consult on cases and outline training topics in order to ensure that the weeklong training would be as productive as possible. 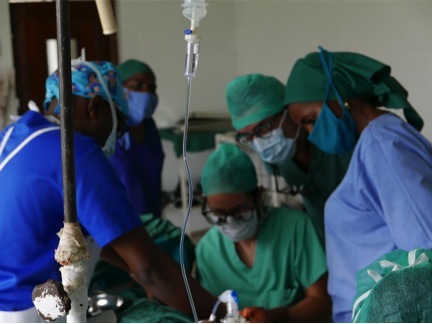 At Sekou Toure Hospital, medical interns, physicians, and nurses play an important role in our surgical work; therefore, our team made sure to connect with them during multiple presentations given by surgeon educators throughout the week. However, our main focus of course, was the hands-on surgical training. Our two surgeon educators and two local Tanzanian surgeons worked together throughout the process of patient consultation, surgical design, procedures, and recovery instruction. This critical balance of demonstration and guided practice lead to the acquisition of new skills by our partners, who were left with increased confidence and a few new surgeries they can now perform independently.